Hearing Consultants is a highly sophisticated and customer oriented audiology practice. With over 20 years of experience serving the hearing needs of metro Detroit, Hearing Consultants is well respected and highly regarded for their technology, education and customer service. The audiologists at Hearing Consultants will evaluate your hearing loss, individual lifestyle, and unique requirements before recommending a hearing aid. Our audiologists continually update their training taking continuing education courses and attending seminars to stay abreast of the continuously changing world of hearing aids. We use state of the art equipment to diagnose your hearing problems, and every fitting is verified using Probe Microphone Measurements to assure you are receiving appropriate hearing instrument programming..
Our staff will make your office visits pleasant by providing you with the best customer service. We focus on patient education, take our time with you, and do our very best to help you achieve improved hearing. Hear what some of our satisfied patients have to say about their experience at our hearing practice. 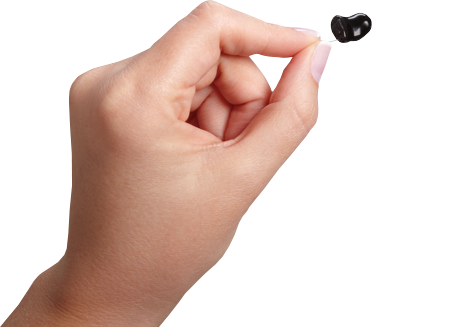 Hearing technology so small you won't believe your ears.